Simon Moya-Smith: Native American fry bread is the food of our oppression. It's also delicious, so we're reclaiming it. Simon Moya-Smith Native American fry bread is the food of our oppression. It's also delicious, so we're reclaiming it. The history behind this food is nothing short of racist and brutal, and begins with America’s first prison camps. For hundreds of years, white invaders — popularly known as “settlers” — declared open war on Native Americans, and not just our bodies. It was also a war on our spiritualties, cultures, crops and anything that had to do with our existence and survival. They wanted to erase us from the continent completely. My son was mocked for his 'stinky' ethnic lunch. Then we fought back. One of the legacies of that brutal aspect of colonialism is now a beloved deep-fried confection found throughout the U.S. at pow wows, Indian art markets and all manner of Native American shindigs and dinners: It’s called fry bread. 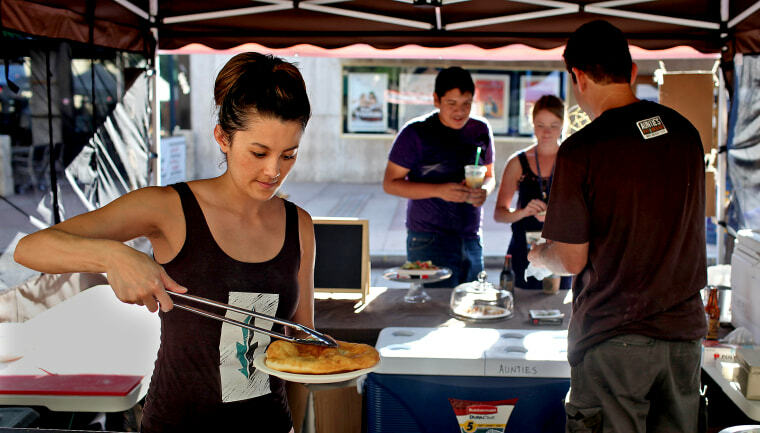 Fry bread is considered Indian country’s “soul food,” because — just like barbecue ribs, which were borne during the evil enslavement and persecution of Africans in the U.S. — fry bread never had its place in Indian country until white, government officials forced Navajos and other nations and tribes into prison camps and began a commodity food program, which was meant to prevent starvation among the remaining Natives, since they could no longer farm the barely-arable land onto which they were forced. For years, the food program, was replicated across the prison camps, later called reservations, established on lands the white colonialists didn’t want for themselves — until later, when they discovered minerals and oil under reservation soil). Like what came to be commodity food boxes in the late 1970s, the rations consisted mostly of flour, lard, salt, sugar and canned goods — ultimately unhealthy staples and ingredients, but there was enough to make some fried bread. In many cases, it was either that or starve. Chef Sean Sherman, 45 — a citizen of the Oglala Lakota Nation affectionately known as “The Sioux Chef” — said his diet primarily consisted of the artery-clogging, diabetes-inducing “commod” foods until he left the Pine Ridge Reservation in South Dakota (originally designated by the U.S. as Prison Camp No. 334), including fry bread. And even today, you can find indigenous folks like Bernadette Casados standing at a gas stove at her home in Grants, New Mexico, making fry bread with an apron wrapped tightly around her waist. “I think a dozen will be enough,” she says, slapping dough from one hand to the other, periodically kneading it with her knuckles. She’s doused in flour. Oil in a pan simmers and pops. It’s delicious. It’s fluffy. And yet the history behind it is nothing short of racist and brutal, and the story begins with America’s first prison camps. “I won’t make [fry bread] that often,” she said. “It’s not entirely healthy, but it is good to have once in a while as a reminder of what white people did, what Natives had to endure, what we still endure,” she said. You won’t find much fry bread in Chef Sherman’s Minneapolis kitchens nowadays, either. The author of the award-winning book, “The Sioux Chef's Indigenous Kitchen” said that he decided one day to abandon all ingredients that are not indigenous or regional to areas in U.S. and Canada. Instead, he embarked on journey to decolonize cuisine all together. Don't be shocked that Swedish meatballs are Turkish. All your food is from somewhere else. Sherman, who said although there are “hardly any Native American restaurants out there in major cities like New York, Chicago, L.A.,” that isn’t to suggest there aren’t indigenous cuisines. Ben Jacobs, who is Osage and a co-owner of Tocabe in Denver, Colorado, is one such restaurateur, who dishes out traditional indigenous eats with a modern twist. His place operates much like a Chipotle: Stand in line, order a fry bread, slide along and order your toppings. Jacobs says they purchase all of their ingredients — including corn and meat — from indigenous companies as a way to help other indigenous entrepreneurs and small business thrive. Still, fry bread reminds us of a time when Native Americans, starving and outnumbered, did everything they could to survive aggressive encroachment and persecution. And although fry bread wreaks hell on the arteries, it’s good for the heart and certainly the soul. It is both delectable and uniquely Native American — but it is also important to remember where it came from, the dark history of its birth. All food has a story, and this one is ours. Simon Moya-Smith is an Oglala Lakota and Chicano journalist. His new book, “Your Spirit Animal is a Jackass,” published by Minnesota University Press, will be available in 2019.